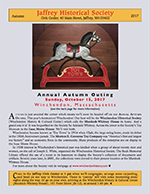 Winter 2018 Report on Autumn outing to Winchendon History and Cultural Center. Reports on Archives, Membership, a postcard exhibit this summer, and The Meetinghouse Roof. Autumn 2017 Report on the Phil Cournoyer's talk on W.W. Cross. 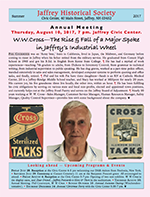 Excerpts from the Town History on the tack factory and W.W. Cross. Reports on the Little Red Schoolhouse, Membership, adn the new Jaffrey Little Library. Summer 2017 Description of the trip to the Murdock-Whitney House, the home of the Winchendon History and Cultural Center. The trip included several stops in Winchedon, including the Isaac Morse House, Murdock Middle and High Schools, Winchendon Old Center, Massachusetts Veterans' Memorial Cemetery, and Clyde, the iconic giant rocking horse of Winchedon. Reports on the Little Red Schoolhouse and the Archives. Write up of the mineral spring on Rt. 124 and a strange board that might have been used to measure lumber. 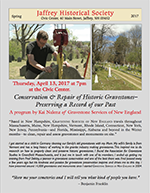 Spring 2017 Write up of the program "Conservation and Repair of Historic Gravestones" by Kai Nalenz. The issue also contains a report on the February 9th potluck. Updates on recent acquisitions including a trunk donated by Randy Cournoyer which was once owned by Jule Durant. 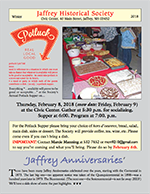 Winter 2017 Announcment of the Potluck Supper in February and program on dog sledding and Winter Carnival in Jaffrey. Write up of the historical society's trip to the Wilton Historical Society. Reports on collections and an update of Vicki Arceci's development of a database of every program and event since 1958. Published on April 20, 2012. "A short clip from the Jaffrey Historical Society where the story of the unsolved murder of Dr. William Dean. Items from the murder scene are displayed and discussed. Was he murdered by German spies? The town banker?" A .pdf version of a presentation that has been given at the Historical Society of Cheshire County, Keene Public Library and elsewhere.